and synthetic material (men's clothing). 78 x 73 inches. 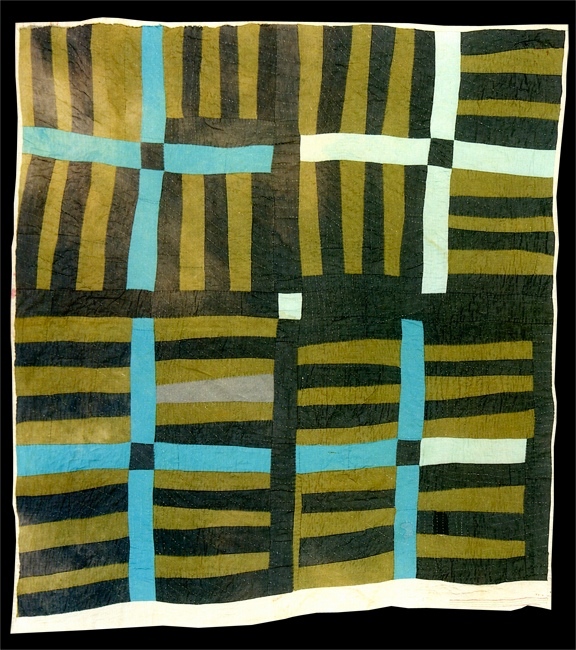 I've been thinking a lot about improvisational quilting lately. It is honestly my favorite way to work. For me, it's much more exciting to create a quilt as I piece the blocks, changing the layout and designs as I sew, instead of following the precise instructions of a pattern. 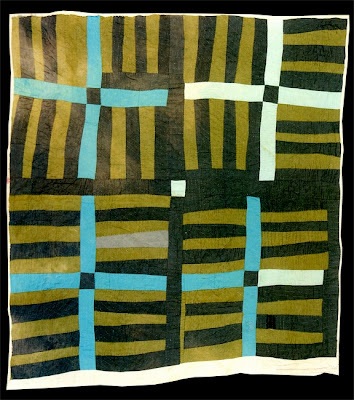 With improvisational quilting, anything works, so there's also less frustration if the finished blocks don't turn out "just right." Didn't use patterns for quilts, neither. None of this family have used patterns. We got a tradition of the old peoples' way...Everybody made their own designs. We was taught there's so many different ways to build a quilt. It's like building a house. You can start with a bedroom over there, or a den overhere, and just add on until you get what you want. Ought not two quilts ever be the same. You might use exactly the same material, but you would do it different. A lot of people make quilts just for your bed, or to keep you warm. But a quilt is more. It represents safekeeping, it represents beauty, and you could stay it represents family history. I couldn't agree more either. I've enjoyed doing some improvisational pieces. Makes quilting seem like "play" and the results are usually better than my planned pieces. Yes, yes, yes! I love starting out with a general idea and seeing where it goes.